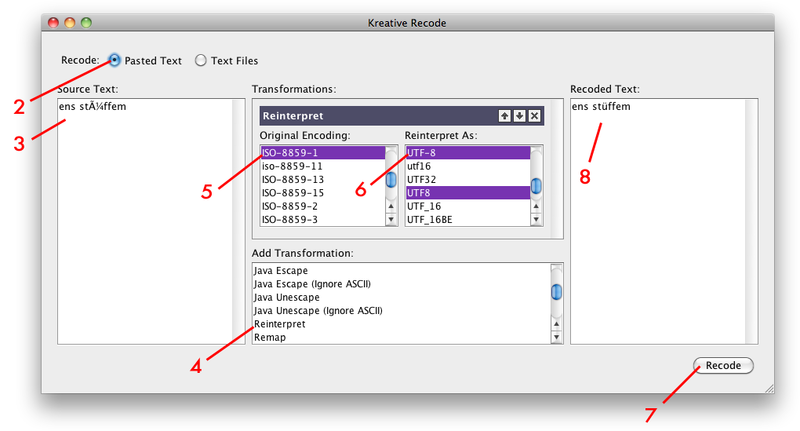 Kreative Recode is a utility for converting text files between different text encodings and performing various transformations on text files or any arbitrary piece of text. Convert text files from Windows-1252 encoding to UTF-8 (or from any encoding to another). Convert UTF-8 text mistakenly interpreted as ISO-Latin-1 (or any other encoding), e.g. from web pages, back into Unicode. Perform ROT-13 on a piece of text. Replace Unicode characters in an HTML file with HTML entities. Perform a character frequency analysis on a piece of text. Convert Deseret or Shavian text from the old CSUR encoding to the accepted Unicode encoding. Convert Tengwar or Cirth text from the 1998 proposed encoding to the updated 2001 proposed encoding. Convert X-SAMPA (or CXS) text to Unicode IPA characters (or vice-versa). Version 1.3a (Oct 27, 2013): Added mappings for D'ni. Version 1.3 (Feb 9, 2013): Added mappings for Sylabica 2007 and Sylabica 2013, and allows selecting a different font for text boxes. Version 1.2 (Dec 22, 2012): Initial release. Version 1.0: Also known as TolkienRecode. 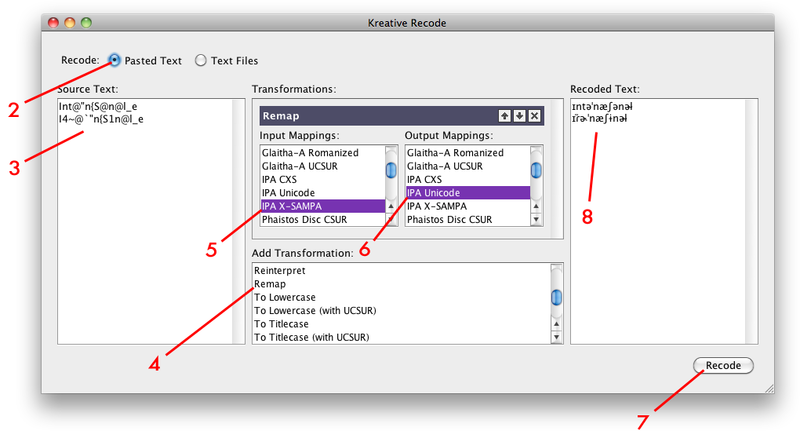 Using Kreative Recode to convert text files from Windows-1252 encoding to UTF-8 (or from any encoding to another). Select Text Files to convert text files. Under Source Files, click the Add button and select a text file to add. Repeat for the other files you wish to convert. Under Destination, select Overwrite Originals to overwrite the original text files, or Separate Directory to save the reencoded text files in another location. If you opt for the latter, click Browse and select a location. Click Recode to convert the text files. Using Kreative Recode to convert UTF-8 text mistakenly interpreted as ISO-Latin-1 (or any other encoding), e.g. from web pages, back into Unicode. Select Pasted Text to convert arbitrary text. Under Source Text, paste the text to be converted into the text box. Under Transformations > Reinterpret > Original Encoding, select ISO-8859-1 (or whichever text encoding the text was mistakenly interpreted as). Under Transformations > Reinterpret > Reinterpret As, select UTF-8 (or whichever text encoding the text should have been interpreted as). Click Recode to convert the text. Under Recoded Text, select and copy the reencoded text. Using Kreative Recode to perform ROT-13 on a piece of text. Under Transformations > Caesar Cipher, enter 13 for the Shift value. Under Recoded Text, select and copy the converted text. 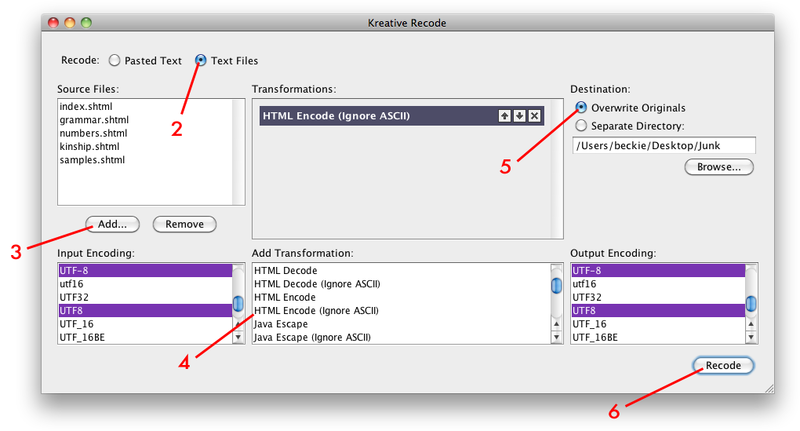 Using Kreative Recode to replace Unicode characters in an HTML file with HTML entities. Under Source Files, click the Add button and select an HTML file to add. Repeat for the other files you wish to convert. Under Add Transformation, select HTML Encode (Ignore ASCII). (Ignore ASCII) is an important distinction: it will preserve the HTML markup. Under Destination, select Overwrite Originals to overwrite the original HTML files, or Separate Directory to save the converted HTML files in another location. If you opt for the latter, click Browse and select a location. Click Recode to convert the HTML files. 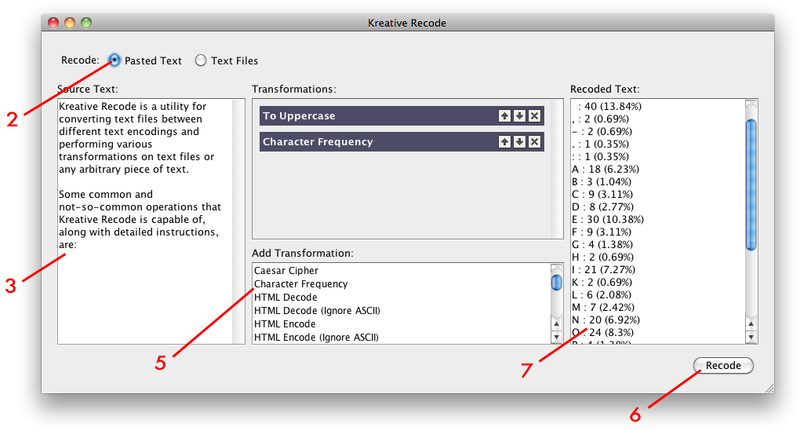 Using Kreative Recode to perform a character frequency analysis on a piece of text. Select Pasted Text to process arbitrary text. Under Source Text, paste the text to be analyzed into the text box. Under Add Transformation, select Character Frequency. Click Recode to analyze the text. Under Recoded Text, select and copy the results of the analysis. 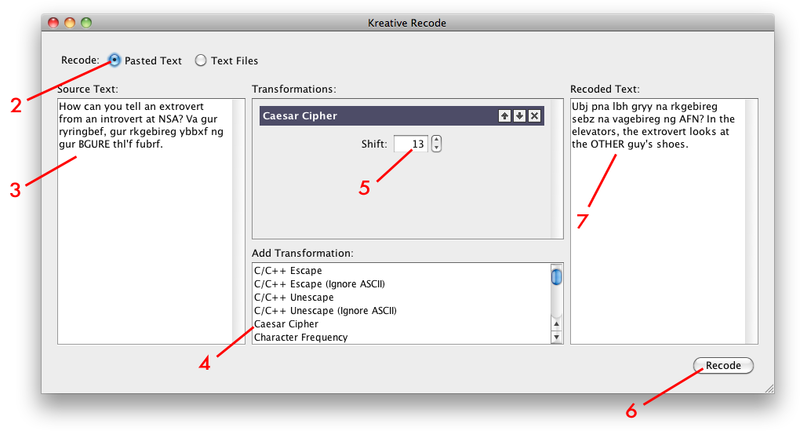 Using Kreative Recode to convert Deseret or Shavian text from the old CSUR encoding to the accepted Unicode encoding. Select Pasted Text to convert arbitrary text. Or, select Text Files to convert text files. Under Source Text, paste the text to be converted into the text box. Or, under Source Files, click the Add button and select a text file to add, then repeat for the other files you wish to convert. Click Recode to convert the text or text files. 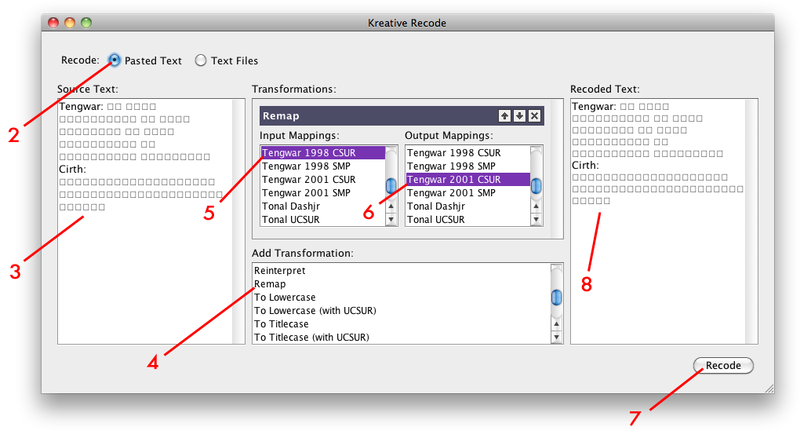 If you selected Pasted Text in step 2, under Recoded Text, select and copy the reencoded text. Using Kreative Recode to convert Tengwar or Cirth text from the 1998 proposed encoding to the updated 2001 proposed encoding. Using Kreative Recode to convert X-SAMPA (or CXS) text to Unicode IPA characters (or vice-versa). Under Transformations > Remap > Input Mappings, select IPA X-SAMPA or IPA CXS (or IPA Unicode to go the other way). Under Transformations > Remap > Output Mappings, select IPA Unicode (or IPA X-SAMPA or IPA CXS to go the other way).